Quick exchange of information: Interview is a kind of oral communication. Through interview information is exchanged in the form of face to face conversation between the interviewer and interviewee on any specific topic. 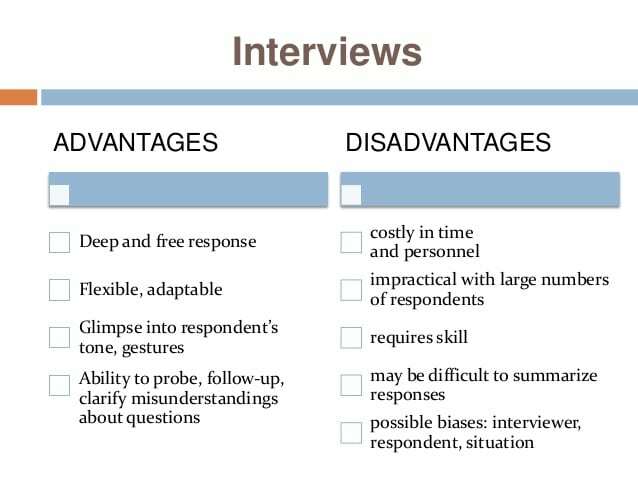 This helps quick, free and fair exchange of information between the interviewer and interviewee. Instant response: Interview is a kind of face to face conversation. Here the interviewee responds quickly to the questions of the interviewer. Therefore, interviews are arranged to know the opinions, attitudes, reactions, depth of knowledge etc of job seekers or other persons form their responses. Setting grievance: Interview is an effective means of setting grievance of any aggrieved person. Since interview allows open discussion between the interviewee and interviewer, real causes of grievance can be detected easily. Thus necessary actions can be taken to settle the grievance. Evaluating mental state: By arranging interview, interviewer can assess the mental strength, level of confidence and ability to handle stress of the interviewees form their facial expression, way of speaking etc. Checking the candidate’s qualifications: Interview helps the employers to evaluate educational qualifications, efficiency, performance, willingness etc. of the job seekers. Developing relationship: In an interview interviewer and interviewee can directly exchange information on any predetermined issue. This helps to increase their level of understandings and enhancing relationships between them. Informing the candidate about some matters: Interview is also an effective means to inform the job seekers about the company’s missions, objectives, goals, duties and responsibilities of the job etc.